In the darkness of the projection room, a dark grey frame stands out, barely lit by vague gleams in its upper part, to right and left. 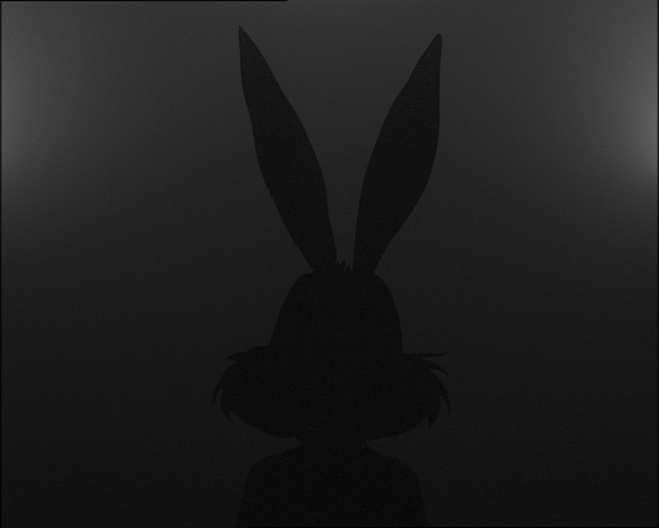 Back-lit silhouettes, those of film heroes and well-known cartoons, slowly appear in the bottom of the screen; their progress brings them gradually into the field of the camera, as if emerging from real space (that of the projection room) and then takes them towards the back of the screen, towards the light source, where they disappear, as if swallowed up by the mist. Then another silhouette, and at times two, appear, then disappear once again. Bugs Bunny, Mary Poppins, and Mickey and Minnie, once colourful and restless characters, form a populace of shadows. But these characters simplified by the backlit device used by Maïder Fortuné are not disembodied: they are real people who have donned the costumes of characters, and they evolve in a real space. The movement of the bodies, slowed down and controlled, then develops in a floating choreography which evokes dream images, a magic lantern giving its last flashes of light. Maïder Fortuné talks about Curtain! in these terms: “Between movement and suspense, the image, relieved of the decoy / enigma at the crossroads of recording (technical, psychic, and its presentation) and its presentation (presentness of projection, presence of spectator) / fleeting visions, persistent shadows/figures of anamnesis, shifters of memory / dovetailings of paradoxical times / traverses of thick, vertical durations / variations, scansions, scans / wunderblock …” Here, Maïder Fortuné organizes a cosy suspension of meaning and time, where the figures are spectres of memory, obscure mental traces with superfluous features. Freed from their original narrative context, they open here to abstraction; this shadow theatre thus delivers its empty wrappings. “Curtain!”, the characters in this video are heroes after the end of the performance. As part of the exhibition Suspended Spaces #1, and more precisely in the maze of the exhibition unit constructed for the Maison de la Culture, Maïder Fortuné’s video appears like a counterpoint--a way of distancing the importance of the geographical and political space of Famagusta. This work is actually the only one not to toy with a certain representational “realism”. Here, on the contrary, the studio presentation refers to a fictional, drawn world, where everything is constructed, organized, and orchestrated.